Home/office furniture/What Are Your Office Tools for Life? In April, Knoll introduced a new set of office furniture by OMA. The collection debuted in Milan, Italy, and features the provocative designs of Dutch architect Rem Koolhaas. This assortment of office “Tools for Life” features items that support both work and socialization. The underlying ethos of the project is unpredictable functionality. The pieces have obvious purpose yet can also be configured in unexpected ways to deliver surprising results. It’s the interface between people and object that makes the furniture come alive – like kinetic sculpture. The 04 Counter is an example of this animated furniture style. It starts as a solid stack of three horizontal beams. 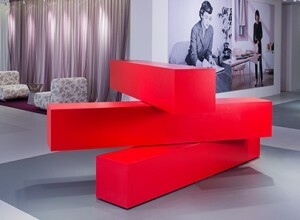 With a few quick movements, the stack can be twisted and separated to turn this monolithic wall into a space divider with all manner of angles. Each piece can rotate smoothly through 360 degrees to create a communal architecture for people to sit on, lean against, or gather around. We imagine the exposed beam surfaces would make a great place to set a file folder or a cup of coffee – until someone moves the beams again and knocks everything to the floor! Additional items in the collection include height adjustable work/meeting tables, stacked swiveling coffee tables, bench and work/lounge seating. The materials featured throughout the set are simple yet diverse, ranging from natural elements like wood, leather and travertine to more sterile substances such as acrylic, aluminum and even concrete. You won’t find a lot of vibrant color (other than red) or 100 textile options, but the collection makes up for not being totally fashionable by being very capable. It’s all designed for a fairly mobile workforce that flits from spot to spot depending on the task at hand. Naturally, there’s also an “ancillary” tool that serves as a privacy and acoustic screen. Here’s the product description: “A base of clear acrylic supports panels of foamed aluminum, travertine or wood grain laminate that can be cantilevered off-center.” No office toolbox is complete without some way to cut down on distractions and increase productivity. These are floor-based models, so if you want something that’s desk-mounted, you can check out our OBEX privacy panels. The aluminum and clear polycarbonate would be a seamless match for the OMA collection.